Are you re-designing or having a new website? Get a good start by getting inspiration from your analytics data. Besides thinking about SEO and Accessibility, as our last two posts were about, it’s also a good idea to consider web analytics when you have to develop a new website or make a major redesign of your existing one. There is a wide variety of opportunities to use web analytics to help you create your new website. It can be anything from documenting your results to make your case for management to allocate the resources needed, to analysis that supports the graphical design and target group analysis that can be used to develop user profiles of the visitors. But basically there are two phases when we talk about web analytics in connection with the re-design and development of new website: a pre-launch phase and a post-launch phase. The pre-launch phase is where web analytics should be implemented in the project as early as possible to give you strategic advantages by having access to information about how visitors use your existing website. By using web analytics to understand how visitors use your existing website when you're doing your initial research for your new website, you ensure that you right from the start is supporting the redesign or new web project with relevant data. What content on our current website do they look at? How do they end up on our current website? What do they do/where do they go when they visit the website? What feedback have we received from our users? Knowing the geographic location of your users, their technical specifications, and whether they use computers or mobile devices when visiting your website will give you a clearer picture of your users and where to focus your efforts. It isn't realistic to expect to have complete answers for all the questions above, but combined with other information such as a survey the picture of the users' profiles is much sharper. Combine the above with an analysis of the most popular content (and the least popular), how users are finding the website, the users' behavior and the most used routes on the website, and you have a strong foundation to support and develop the web strategy for its re-design/new website. After the launch of your new website/redesign, you must ensure the continuous optimization of your website by implementing a lasting workflow enabling the constant measuring, analyzing and optimizing of your website. This process must be an iterative process where you are constantly working to optimize the user experience for your visitors. In order to work iteratively to optimize and analyze your new website, you need to have access to the correct Key Performance Indicators (KPI's), measurements, and a full dataset available. This brings us back to the pre-launch phase again. During the planning and development in the pre-launch phase you should ensure you have implemented your web analytics tool properly. At the same time, it's important to make sure you have developed your website in a way that makes it possible to extract the data needed to work with the continuous optimization of the website. A proper set-up from the start does not cost that much extra time, but will certainly pay off in the long run. 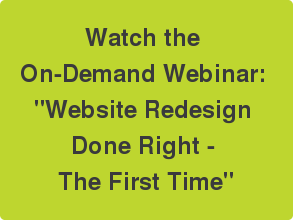 Watch the On-Demand Webinar "Website Redesign Done Right - The First Time". Blog post: Make Your New Website Accessible from Day One. Blog post: 9 Ways to Keep Your Search Rankings During a Website Redesign.